Shake Shack fans in NYC are in for a rare treat today -- but only if you act fast. 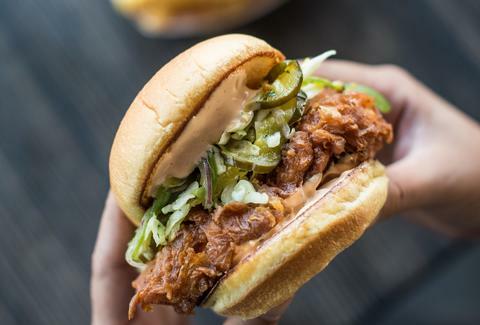 A new limited-edition sandwich, the Son of a Gun Chick’n Shack, is on sale right now at the popular burger chain's flagship location in Madison Square Park. As you may have guessed by the name, this sandwich -- described as a "crispy chicken breast with spicy B&B pickle slaw and rooster aioli" -- is a riff on the popular sandwich at LA's Son of a Gun restaurant, whose chefs, Jon Shook and Vinny Dotolo, collaborated with Shake Shack to create the thing. The Son of a Gun Chick'n Shack is priced at $6.49 and available while supplies last -- and only at the one location in Madison Square Park. Worried about the line? Check out the handy Shack Cam for a real-time look at the wait. As of press time, the crowd actually didn't look too massive. Chris Shott is Thrillist's Senior New York Editor. He's been known to make occasional cameos on the Shack Cam. Follow him on Twitter and Instagram.